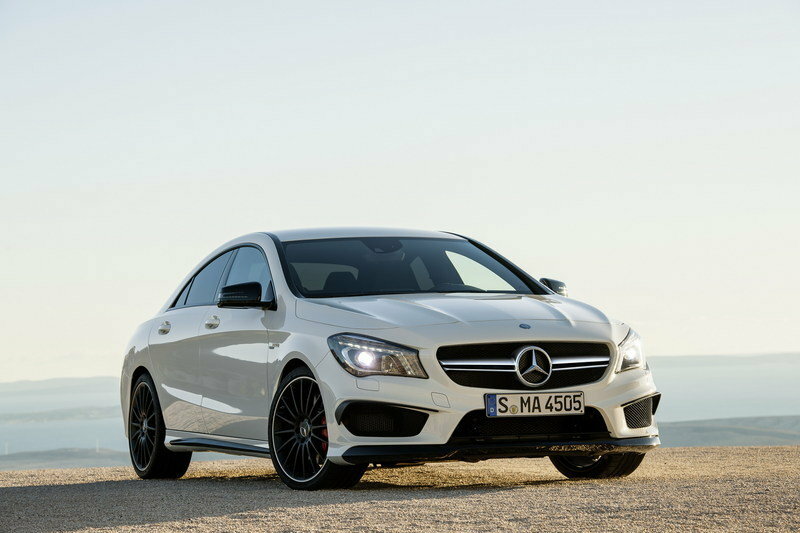 The Mercedes CLA has been officially unveiled at the 2013 Detroit Auto Show, and, as the spy shots revealed, the next logical step was a more powerful, AMG version. 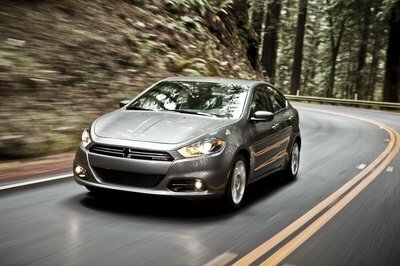 The model made its debut today at the 2013 New York Auto Show and will be put on sale in September. 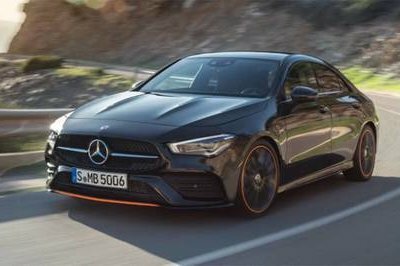 When compared to the standard CLA-Class, the new AMG version will add a more aggressive design language, with elements we have already seen on models like the CLS 63 AMG. These specific elements include an AMG "twin blade" radiator grille, an AMG front apron, large cooling air intakes and for the rear an AMG apron and of course the two chrome-plated twin tailpipes of the AMG sports exhaust system. Even if a tiny sedan, the new CLA 45 AMG is offering technologies used in the SLS AMG sports car, like the cooling system for the four-cylinder engine. Updated 03/19/2013: This review has been updated with the official details, images and specifications. Updated 06/17/2013: Mercedes has just announced prices for the most powerful version in the new CLA-Class lineup. 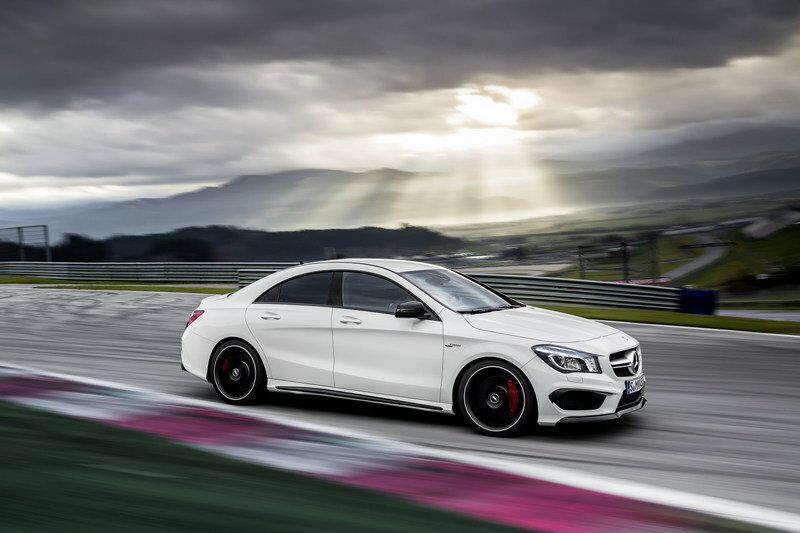 Click past the jump to learn more about how much you have to pay for a CLA 45AMG. Updated 09/17/2013: Mercedes unveiled a new video featuring both the A45 AMG and the CLA45 AMG in action at the Bilster Berg race track. Enjoy! 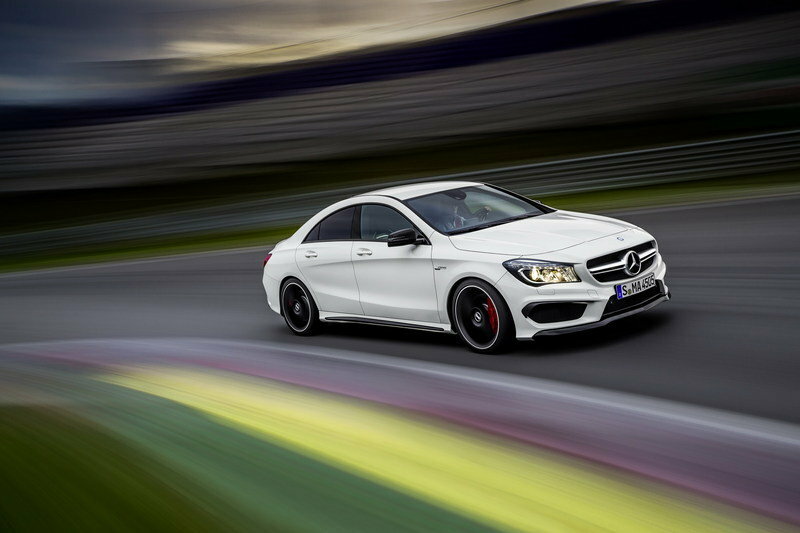 Hit the jump to read more about the 2014 Mercedes CLA 45 AMG. 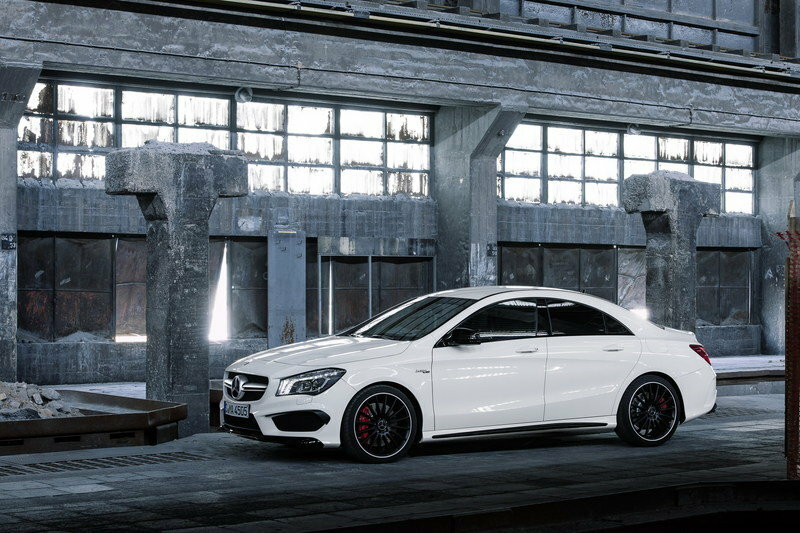 The new CLA 45 AMG is designed as an alternative to those who consider the CLS 63 AMG too large for them. So, as no surprise the model retains design elements from its bigger brother. Up front, the new CLA 45 AMG receives an AMG "twin blade" radiator grille and cross strut in the AMG front apron, both painted in matte titanium grey. Efficient engine cooling is provided by large air intakes framed by black flics. On the side, AMG added sill panels with insertions in matte titanium grey and large "Turbo AMG" logo on the wing. At the rear, the new sports sedan adds an AMG apron with an incorporated large diffuser insert and a trim section in matte titanium grey. The final element is the AMG sports exhaust system with its two chrome-plated twin tailpipes. For the interior, Mercedes is also offering specific AMG elements, like sports seats in ARTICO manmade leather/DINAMICA microfiber with red contrasting top stitching, red seat belts, a multifunction steering wheel with shift paddles, an AMG DRIVE UNIT and AMG door sill panels. 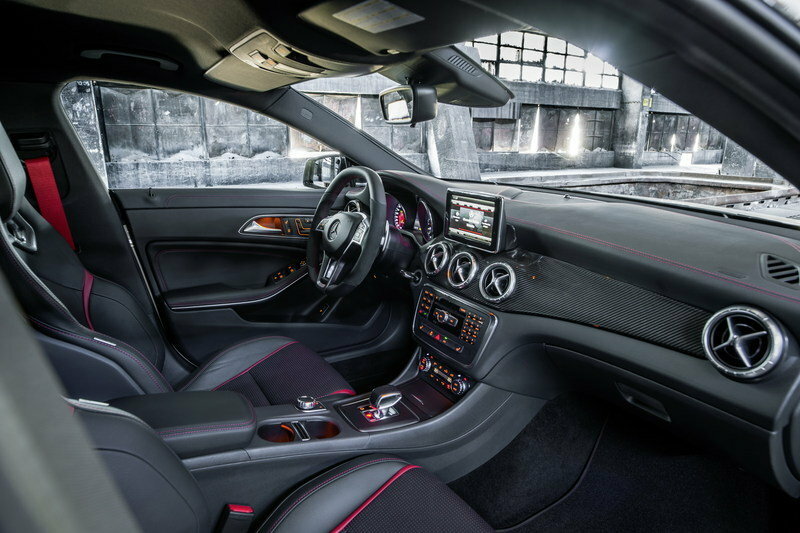 The instrument panel and the five galvanized ventilation outlets received an aluminum trim, while the AMG instrument cluster gets a central color display, an AMG menu and a Race Timer. Under the hood, Mercedes has placed the same engine as in the A45 AMG. 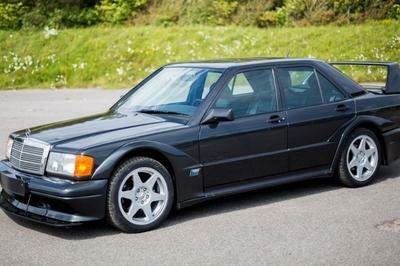 This AMG-built 2.0-liter turbo engine that delivers a total of 360 horsepower and a peak torque of 331 pound-feet. The engine is combined with the performance-oriented AMG 4MATIC all-wheel-drive system. This drivetrain sprints the car from 0 to 60 mph in just 4.6 seconds and up to a top speed of 155 mph. The new turbo engine features a highly effective cooling system that is inspired by the SLS AMG, and mates to an AMG SPEEDSHIFT DCT 7-speed sports transmission, with software modules also inspired by the SLS AMG. This transmission offers seven gears, three driving programs, a double-declutching function and RACE START for optimum acceleration. For an even more impressive driving experience, the new CLA 45 AMG will also be equipped with a performance-oriented AMG 4MATIC all‑wheel drive system combined with the 3-stage ESP and the ESP Curve Dynamic Assist systems. For enhanced driving dynamics, the new CLA 45 AMG has a three-link front suspension with stiffer steering knuckles and totally new elasto-kinematics. With this new system, the strut bearings were duly adapted for maximum driving dynamics and control. The suspension system is also equipped with specifically tuned spring-an-damper units and larger stabilizers. The model is offered with standard AMG light-alloy wheels wrapped in 235/40R18 tires. Bringing the CLA 45 AMG to a halt is a high-performance braking system with ventilated and perforated brake discs all round, sized 350 x 32 mm (13.77 x 1.25 inches) at the front and 330 x 22 mm (12.99 x 0.86 inches) at the rear. 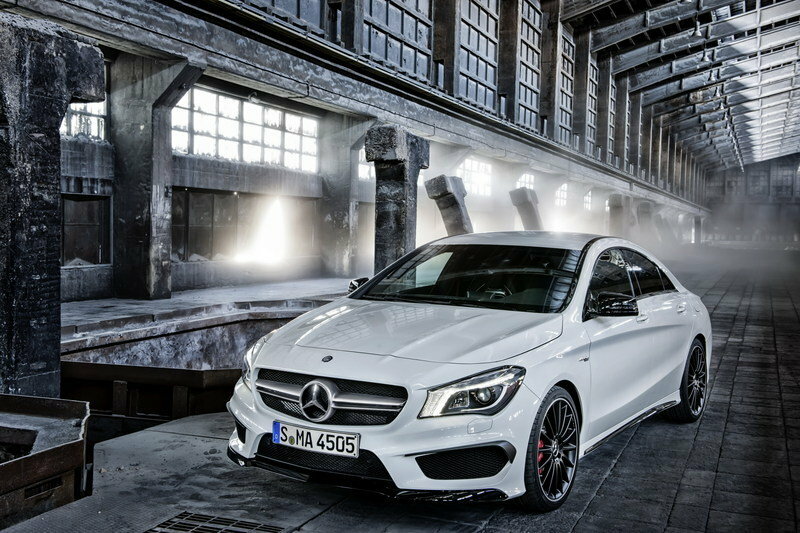 The new Mercedes CLA 45 AMG will be put on sale in September 2013. On the U.S. market the model will be priced from $48,375 - or about $18k more than a standard CLA-Class, which is priced at a little over #30k. With the new CLA 45 AMG, Mercedes is establishing a completely new segment – as it did previously with the CLS 63 AMG Shooting Brake in 2012 and the CLS 55 AMG in 2004. Still, there are a few models out there that can be considered as competitors for it, even if not direct competition. The new CLA 45 AMG will meet one of its competitors in New York: the new Audi S3 sedan. Unlike the AMG model, the new S3 will deliver a little less power: it will be offered with a 2.0 TFSI producing a total of 300 horsepower. 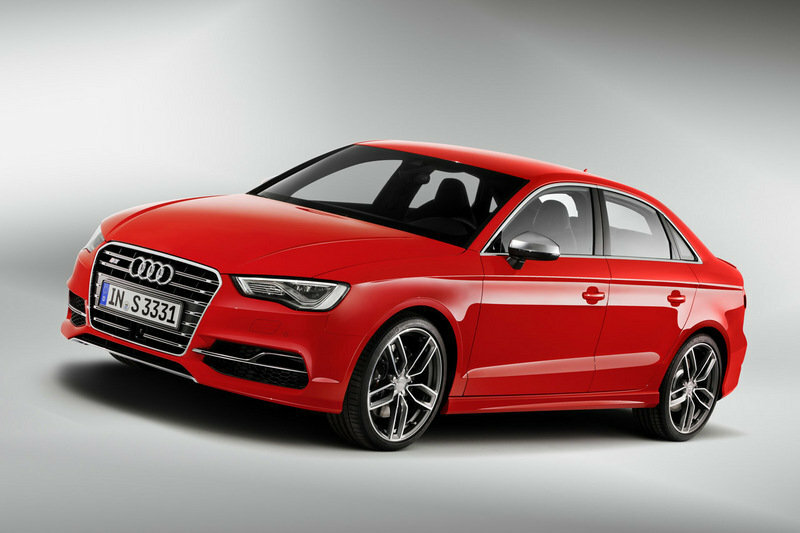 Still, the S3 has the advantage of being offered with a choice of two transmissions, both manual and automatic. The new Mercedes CLA 45 AMG is a model that has a huge advantage at this point: there are no other alternative to it on the market. And, if Mercedes will find a way to keep it cheap (we mean in the U.S. market) we are pretty sure lots of customers will turn their attention to it. No prices for the U.S.
Mercedes-AMG kicks off the automotive spring of 2013 in the "Big Apple" in dynamic style as the CLA 45 AMG celebrates its world premiere at the New York International Auto Show. The philosophy behind this four-door mid-series coupé matches that of the successful CLS 63 AMG, the trendsetter among four-door high-performance coupés. A glance at this high-tech package suffices to show that the CLS 45 AMG also has all the typical DNA to make it a perfect representative of the AMG’s Driving Performance brand claim: with a peak output of 265 kW (360 hp) and maximum torque of 450 Newton metres, its turbocharged engine is not only the most powerful four-cylinder unit in series production anywhere in the world but also a highly efficient one that meets the EU6 emissions standard. With fuel consumption of 6.9 litres per 100 km according to NEDC combined figures, the CLA 45 AMG meets even the most exacting requirements. The performance-oriented AMG 4MATIC all-wheel drive of the CLA 45 AMG similarly sets a new benchmark in its competitive segment. Ola Källenius, Chairman of Mercedes-AMG GmbH: "With the CLA 45 AMG, Mercedes-AMG is launching a unique and highly desirable automobile with all the typical DNA of AMG. A high-tech package that includes the most powerful series-production four-cylinder engine in the world as well as performance-oriented AMG 4MATIC all-wheel drive, it embodies Driving Performance at its best." The new four-door high-performance coupé offers an exceptional combination of an excitingly sporty driving experience, extravagant design and exclusive individuality. With the CLA 45 AMG Mercedes-AMG is establishing a completely new segment – as it did previously with the CLS 63 AMG Shooting Brake (2012) and the CLS 55 AMG (2004). At the time of their launch, neither of these AMG models had any direct rivals, but went on to inspire other automotive manufacturers. Turbocharged engine, all-wheel drive and the AMG SPEEDSHIFT DCT 7-speed sports transmission - the CLA 45 AMG features the same drive system that is already powering the A 45 AMG to deliver highly dynamic and efficient performance. A glance at the technical data for the CLA 45 AMG shows: the AMG 2.0-litre turbo engine, with a maximum output of 265 kW (360 hp) and up to 450 Newton metres of torque, is the most powerful turbocharged four-cylinder engine in series production anywhere in the world. The combination of high performance and torque, together with the performance-oriented AMG 4MATIC all-wheel-drive system, gives the CLA 45 AMG driving characteristics almost on a par with those of a sports car. The performance coupé accelerates from zero to 100 km/h in 4.6 seconds and its top speed is 250 km/h (electronically limited). But the AMG 2.0-litre turbo engine is impressive not only in terms of its dynamic performance but also with regard to its efficiency and environmental compatibility. The CLA 45 AMG achieves a fuel consumption level of 6.9 litres per 100 kilometres according to NEDC combined figures, while it already meets the EU6 emissions standard that only comes into effect in 2015 as well as the limit for the particle count per kilometre of 6 × 1011 part./km that will become mandatory in 2017. The basis for these impressive figures is provided by the high-tech package which has been put together by Mercedes-AMG. As a high-performance engine belonging to the BlueDIRECT family, the four-cylinder turbo engine features spray-guided direct petrol injection via piezo injectors positioned centrally in the four combustion chambers. The combination of multiple fuel injection and multiple spark ignition improves fuel utilisation and increases thermodynamic efficiency substantially, leading to lower exhaust emissions. Other highlights include the gravity-die sandcast all-aluminium crankcase, weight-optimised crank assembly with forged steel crankshaft and forged pistons with friction-optimised piston rings, NANOSLIDE cylinder wall technology, air-water charge air cooling, generator management and ECO start/stop function. Mercedes-AMG addresses the essential challenges concerning the response of small-displacement turbo engines by means of a twin-scroll turbocharger, maximum derestriction of the exhaust system and an innovative injection strategy. The twin-scroll technology provides for a more spontaneous build-up of charge pressure, making effective use of exhaust gas back pressure, exhaust gas temperature and exhaust gas impulse. This results in a swifter build-up of torque right from the lower rev range. As a positive side-effect, the twin-scroll technology also benefits fuel consumption and exhaust emissions. With a maximum charge pressure of 1.8 bar, the AMG 2.0-litre four-cylinder turbo engine leads the field in this respect, too. The AMG sports exhaust system features large pipe cross-sections and an automatically controlled exhaust flap. This technology, which is familiar from the SLK 55 AMG, reconciles the two apparently conflicting aims of tangible dynamism and hallmark Mercedes comfort on long journeys. The flap is continuously adjusted by map control according to the power called up by the driver, load status and engine speed. The AMG sports exhaust system emits a fascinating, full engine sound that is particularly impressive during powerful acceleration. An AMG Performance exhaust system with exhaust flap is available as an option for the A 45 AMG. This provides for an even more emotional and striking engine sound when the throttle is open and during gear shifting. The double-declutching function during downshifting and the interruption of ignition and injection during upshifting under full load produce a particularly throaty sound with the AMG Performance exhaust system and create a level of emotionality which is otherwise the preserve of engines with more than four cylinders. 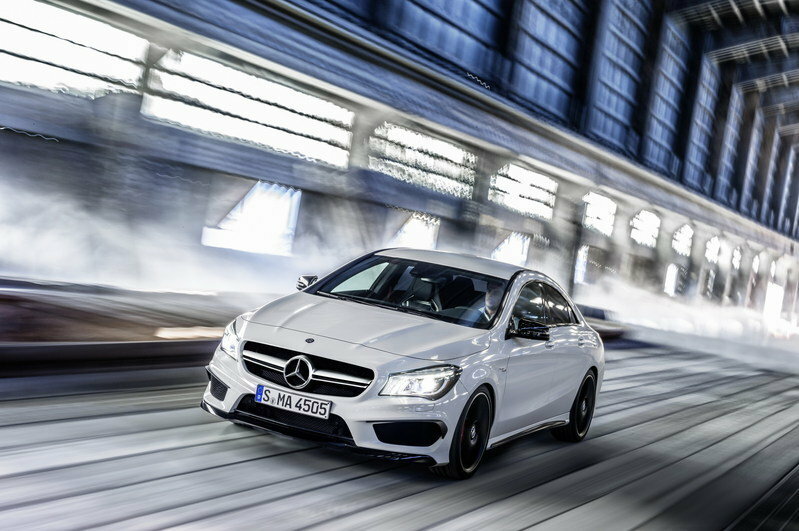 The high driving dynamics of the CLA 45 AMG call for a highly effective cooling system. On the basis of the components from the SLS AMG, a low-temperature circuit is additionally deployed for air-water charge air cooling of the four-cylinder turbo engine. The cooler extending across the complete front level of the cooling module is supplemented by an additional cooler in the wheel arch. Together with the charge air cooler, which is connected in series, a high-performance electric pump ensures the required flow through the water coolers located behind the large intake ports. This provides for ideal cooling of the highly compressed charge air, thereby contributing towards optimum engine performance. The cooling of the transmission oil is integrated into the water cooling circuit for the engine. The water cooler positioned behind the front apron is supported by the heat exchanger which is fitted directly on the transmission and supplied with cooling water as required by means of an auxiliary pump. As is the case with all eight- and twelve-cylinder engines, the new AMG four‑cylinder turbo engine is hand-built according to the traditional AMG philosophy of "one man, one engine". An exclusive assembly line has been set up for the new AMG engine at the Mercedes-Benz engine production plant in Kölleda – where all BlueDIRECT four-cylinder engines are built for the A- and B-Class models. A characteristic feature of the "one man, one engine" production process is the AMG engine plate bearing the signature of the responsible engine fitter. Apart from serving as an AMG hallmark confirming superlative production quality, the AMG engine plate also attests to the peerless DNA of Mercedes-Benz’s high-performance brand. Dual clutch transmission and all-wheel drive – the drive package on board the new CLA 45 AMG is a demonstration of high-end engineering prowess. The AMG SPEEDSHIFT DCT 7-speed sports transmission is directly flange-mounted on the transversely installed engine. Key software modules have been adopted from the SLS AMG super sports car with its inspirational power transmission concept. The dual clutch transmission of the CLA 45 AMG features seven gears, three driving programmes, a double-declutching function and RACE START for optimum acceleration. The strengths of the AMG DCT sports transmission include spontaneous gear shifting without any interruption in tractive power, a tailor-made control strategy, extremely smooth and easy gear shifting and a high level of efficiency. Reinforced gear wheels provide for maximum stability. Synchroniser rings with carbon-fibre friction linings improve durability while also optimising the response time during manual gear-changing – the ideal basis for ambitious laps on cordoned-off race tracks. Another special feature designed to enhance dynamic performance and driving enjoyment is the so-called "Momentary M mode". In C and S mode, this enables the driver to activate manual mode ("M") without having to remove a hand from the steering wheel, by pressing the "up" or "down" shift paddle once. In Momentary M mode the driver experiences the dynamism and performance of gear-shifting in manual mode in all the automatic driving programmes, with automatic up-shifting on meeting the rpm limit into the bargain. This allows the driver to devote his full attention to the vehicle’s impressive performance. The shift times in manual mode "M" and in Sport mode "S" are similarly sporty in character to those of the SLS AMG GT super sports car. 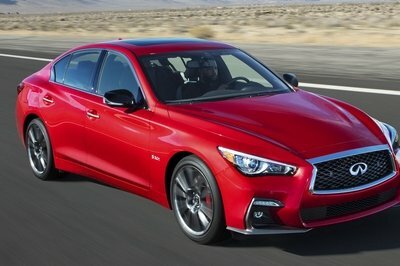 Briefly and precisely interrupting ignition and injection under full load leads to even faster gearshifts in "M" and "S", with a more emotional sound than ever. In "C" mode (Controlled Efficiency), tangibly soft transmission and engine characteristics support a fuel-efficient and comfort-oriented driving style. In addition, in "C" mode the ECO start/stop function is active. 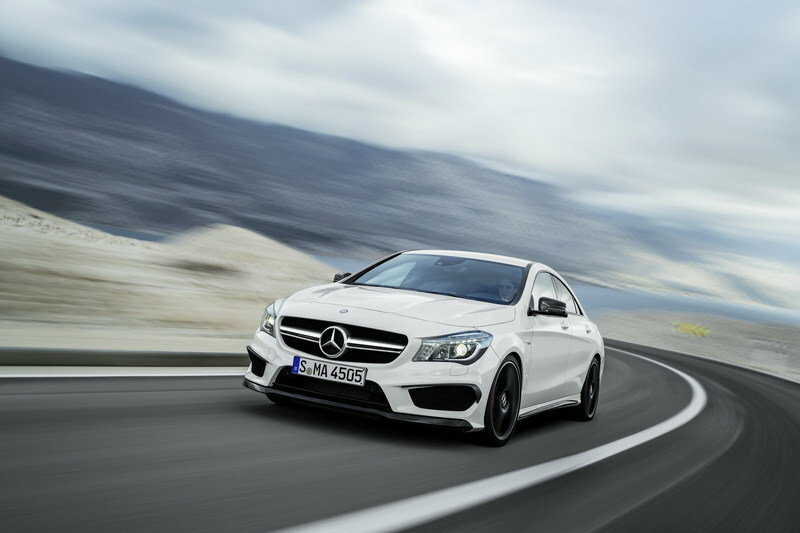 The CLA 45 AMG comes with variable, performance-oriented AMG 4MATIC all‑wheel drive as standard. In developing this all-wheel drive, the focus was firmly on performance and dynamism. 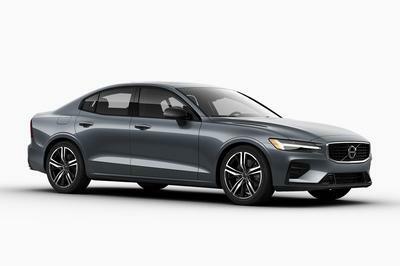 The power flux to the rear powertrain is provided by a compact power take-off unit (PTU) which is fully integrated in the 7-speed sports transmission. It does not possess an oil circuit of its own. Instead, it is supplied with lubricant from the oil circuit of the sports transmission. This configuration gives rise to substantial weight advantages in comparison to rival systems which branch off power by means of an add-on component with its own oil circuit. Together with the friction-minimised tapered roller bearings, the PTU achieves an excellent level of efficiency. As an additional bonus, the system weight of the new AMG 4MATIC all-wheel drive is up to 25 percent lighter than the all-wheel-drive versions offered by the competition. A two-part propeller shaft transfers the power from the AMG 2.0-litre four-cylinder turbo engine to the rear axle. In the interests of favourable weight distribution, an electrohydraulically controlled multiple-disc clutch is integrated with the rear axle differential. The multiple-disc clutch immediately detects slip at the front axle. A hydraulic pump instantaneously presses the discs together and channels the engine torque to the rear wheels as necessary. All this takes place virtually without the driver noticing. To enable particularly fast response, the pump is always active and does not require to be started up each time it is needed, as is customary with other systems. Power distribution is fully variable: in normal driving, the CLA 45 AMG uses front-wheel drive in the interests of optimum efficiency. When the driving dynamics so require, the variable AMG 4MATIC all-wheel drive splits the torque between front and rear axle up to a ratio of 50:50 percent. The variables influencing the power distribution ratio are vehicle speed, lateral and longitudinal acceleration, steering angle, speed difference between the individual wheels, selected gear and accelerator position. An exclusive feature is the interaction of the AMG 4MATIC all-wheel drive with the 3-stage ESP® and the ESP® Curve Dynamic Assist. The three ESP® stages enable the driver to vary the dynamics of the CLA 45 AMG according to his individual wishes at the push of a button. The safety-oriented "ESP ON" mode supports the driver in maintaining neutral handling characteristics. The system initiates braking intervention on one or more wheels and reduces the engine torque on detecting that the operating conditions are becoming unstable. Briefly pressing the ESP® button activates "ESP SPORT Handling" mode. This dynamically oriented driving mode applies appropriate control strategies for later ESP® intervention and increased drive torque at the rear axle. This means more fun at the wheel for drivers who are keen to exploit the vehicle’s dynamic potential. Pressing the ESP® button longer activates "ESP OFF". In this mode, the ESP® functions are not available. ESP OFF should only be used by experienced drivers on cordoned-off race tracks. If the driver steps on the brake pedal in "SPORT Handling" mode or "ESP OFF" mode, all the safety functions of the ESP® system become available during braking. ESP® Curve Dynamic Assist complements the ESP® system to perfection: during dynamic cornering, imperceptible braking intervention on the inside wheel gives rise to a defined yaw moment around the vertical axis, resulting in precise cornering by the CLA 45 AMG and ensuring that the vehicle remains under control at all times. ESP® Curve Dynamic Assist is adapted according to the selected ESP® mode. In "ESP SPORT Handling" mode and "ESP OFF" mode it supports the driver’s wish for increased agility and driving dynamics. ESP® Curve Dynamic Assist is an additional function of the Electronic Stability Program which noticeably improves not only agility, but also active driving safety in critical conditions. 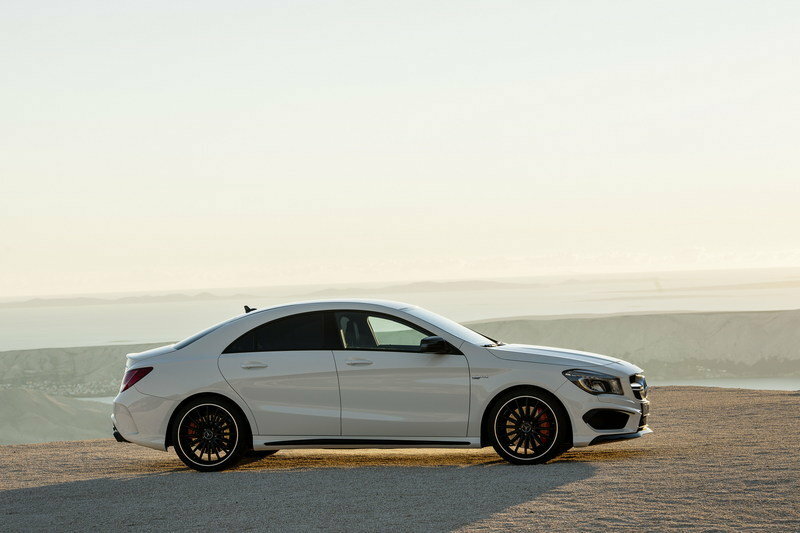 Like every AMG high-performance automobile, the new CLA 45 AMG also incorporates sophisticated axle technology. For enhanced driving dynamics, the three-link front suspension is provided with stiffer steering knuckles and totally new elastokinematics. Newly developed, more rigid bearings are employed in the lower link plane. These provide for more agile cornering properties and more precise and direct feedback from the road surface. The more rigid bearings also lead to higher camber stiffness, enabling higher cornering speeds. In developing the complete front axle, great importance has been attached to attaining the best possible traction in highly dynamic driving. The four-link rear axle of the CLA 45 AMG is also a totally new development. In the course of optimising the elastokinematics, the strut bearings were duly adapted for maximum driving dynamics and control. The rear axle carrier is provided with more rigid bearings for increased driving stability; the subframe is rigidly connected to the body. The AMG sports suspension with specifically tuned spring/damper units and larger stabilisers provides for high lateral acceleration and a reduced rolling tendency in fast double bends. 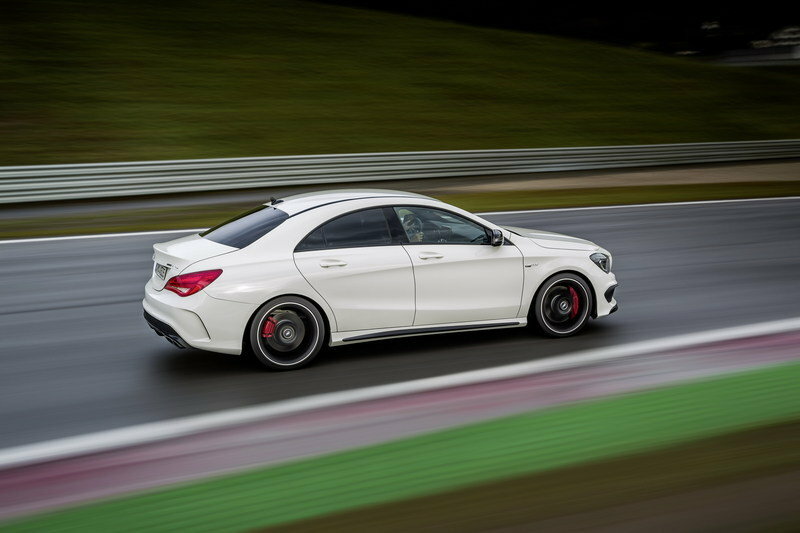 The CLA 45 AMG comes as standard with AMG light-alloy wheels fitted with 235/40 R 18 tyres. Just a glance at the new CLA 45 AMG makes it very clear: any resemblance to the CLS 63 AMG is absolutely intentional. The expressive design idiom of the CLA has been enhanced by Mercedes-AMG with some characteristic AMG elements - and the result is a new design icon. The sporty proportions of the CLA were there from the start , but its dynamic look is reinforced by the AMG "twin blade" radiator grille and the cross strut in the AMG front apron, both painted in matt titanium grey. The generously proportioned cooling air intakes are framed by black flics, which improve the airflow over the cooling modules positioned behind them. Bi-xenon headlamps are included as standard. An eyecatching view from the side is ensured by the sill panels with inserts in matt titanium grey. Further elements typical of a top-of-the-range AMG model include the AMG twin-spoke light-alloy wheels, painted grey and with a high-sheen finish, plus the "TURBO AMG" lettering on the wing. Seen from the rear, the CLA 45 AMG displays a distinctive AMG rear apron: this not only reveals the presence of the air outlet openings at the sides, but also incorporates a large diffuser insert and a trim section in matt titanium grey. The two chrome-plated twin tailpipes of the AMG sports exhaust system, including an exhaust flap, serve to emphasise the car’s dynamic appeal. The striking LED tail lights are a standard feature. Impressive quality, high-grade materials and all the dynamism and exclusivity commonly associated with Mercedes-AMG - the interior of the CLA 45 AMG leaves nothing to be desired. Sports seats in ARTICO man-made leather/DINAMICA microfibre with red contrasting topstitching, red seat belts, the multifunction steering wheel with shift paddles, the AMG DRIVE UNIT and AMG door sill panels all come as standard. Coordinating perfectly with one another are the brushed aluminium trim of the instrument panel and the five galvanised ventilation outlets. Information is provided by the AMG instrument cluster with its central colour display, the AMG main menu and the RACETIMER.